There’s always a moment when the thinking stops and the action has to start. You can dream til the cows come home but it doesn’t get the job done. The stark reality is that it has rained so much and so heavily in the last two or three weeks that water has managed to penetrate every vulnerable point in the deck and has flowed to various points via the cabin lining. Not only that, but the two hatches that were fitted at the aft end of the cockpit, the hatches I thought would be so useful for extra storage, have proved totally unwatertight. This is an extension of the problem with the cockpit drains in Folksongs that John mentioned. The entrance to the drains is almost at water level so that there is always water visible in them. In a torrential downpour, the cockpit quickly fills and the drains only slowly take the water away. This is less of a problem when sailing but on Blue Mistress on her berth the water has had time to ‘flow’ through the hatches. ‘Flow’ seems to be the right word by the state of the quarter berth cushions and the water level in the lockers there. (Thank goodness for duck tape). 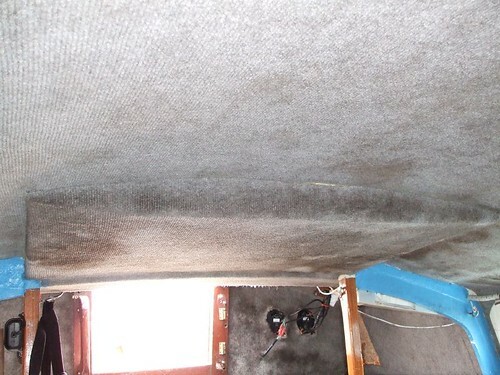 The general feeling of damp was not just due to condensation and the cabin lining, which is similar to the lining they use in wardrobes on the expensive yachts, (imagine), showed damp areas and distinctly wet areas. The leaks are from various deck fittings – including a couple of stanchions which have bent on their bases. I have to thank Andy for thinking it through with me. it needed an outside eye. I look forward to working with him later. 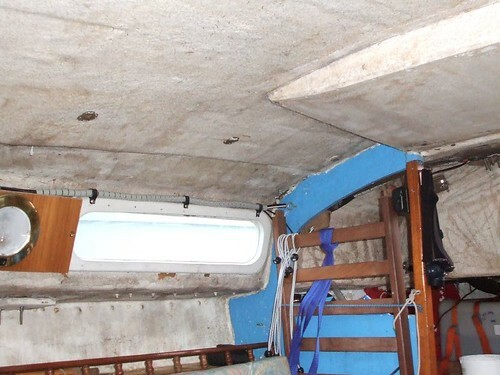 So I stripped all the lining from both cabins – and reduced the damp areas to a few specific points. Now all I have to do is sit there in the rain and circle the defects! The results are two lighter, colder, less cosy cabins – but it’s a step in the right direction. I can still sail over the winter (well, not in this wind) and the repair work can be done under cover in the spring. I don’t know if you have heard of this method of finding leaks in the deck. It worked for me. It involves blowing up your boat, in a manner of speaking. You seal every single place where air could escape, such as hatch covers, cockpit lockers, ventilators etc with duck tape. You cover the companionway with plastic and put the tube from a vacuum cleaner through the plastic. Once it’s all made air tight you put the cleaner on blow and pressurise the boat. After that go round with some washing up liquid and paint it onto the possible leaky places on the deck. With any luck you will see some bubbles and will have found the culprit.